New York City's mayor is suing its city council. At issue: the legality of two new laws setting a minimum wage for workers on many city-funded projects. The council overrode Mayor Michael Bloomberg's veto in June to mandate a wage of at least $10 per hour for workers at companies getting $1 million or more in city funding. They cover all sorts of companies getting city subsidies or contracts, as well as landlords renting space to city agencies. 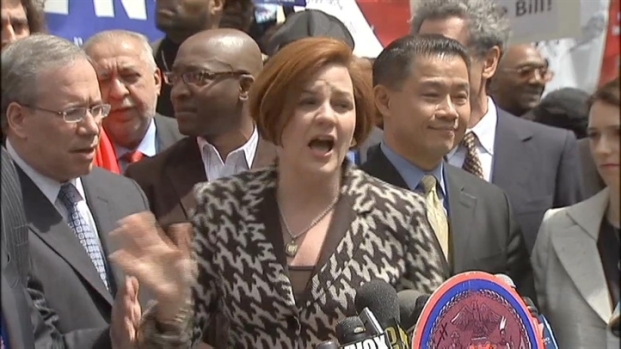 Before the vote, Council Speaker Christine Quinn stormed out of a news conference when a heckler called Mayor Bloomberg a name. Melissa Russo reports. Bloomberg says he thinks the wage requirements hurt business. In a lawsuit filed Friday, the city's legal department also argues that the wage hikes are illegal. City lawyers say only the state is empowered to set a minimum wage. A council spokeswoman says lawmakers are confident the challenge will be shot down.